I am a tenured researcher at the Centre National de la Recherche Scientifique (CNRS). I am affiliated to the Laboratoire d’Analyse et d’Architecture des Systèmes (LAAS) and a member of the RIS team. I was a Senior Research Scientist and Project Leader of the Autonomous Robotics and Human-Machine Systems group at the Max Planck Institute for biological Cybernetics, under the direction of Prof. H. H. Buelthoff. I obtained my Professorial Habilitation (HDR) from the Toulouse Institute of Technology in 2016. I obtained the PhD in 'Ingegneria dei Sistemi' (Analysis and Control of Dynamical Systems) and the master degree in Electronic Engineering at "La Sapienza" University of Rome, under the supervision of Prof. G. Oriolo. I have been a visiting graduate student at the University of California Santa Barbara (UCSB) with Prof. F. Bullo. In the past I worked for embedded-computing-systems and business-consulting companies. Since 2016, I have been an Associate Editor of the IEEE Transactions on Robotics. From 2013 to 2016, I served as Associate Editor of the IEEE Robotics and Automation Magazine and from 2015 to 2016 I served as Associate Editor of the IEEE Aerospace and Electronic Systems Magazine. Since 2014 I have constantly served as Associate Editor of the IEEE ICRA, International Conference of Robotics and Automation, and of the IEEE/RSJ IROS, International Conference on Intelligent Robots and Systems. 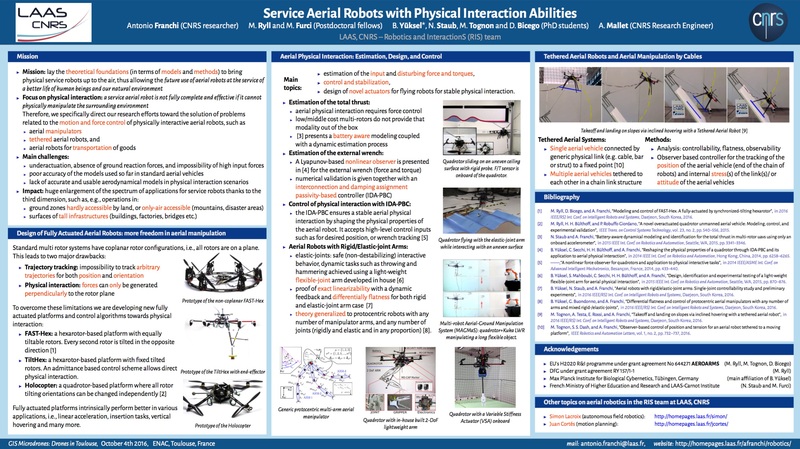 My research interest is focused on autonomous systems and robotics, i.e., on machines which are able to acquire information from an environment, elaborate that information, and then autonomously act on the environment to perform a task. The main goals of this field are to obtain a large degree of autonomy in unstructured environments and a high quality and effectiveness in the interaction between the human and the machine. These two are fundamental steps needed to move the robots from being confined in factories to finally get into our everyday’s life. I am specialized in multiple robot systems,in fact the use of many cooperating robots is the only way to handle the complexity and the spatial sparseness of the reality. A big research challenge is to let the machines behave plainly and efficaciously with the "human-in-the-loop". The control design must take into account how humans act when interacting with a (semi-)autonomous machine to fulfill a common goal. This, in general, would require understanding i) how humans process the sensory information used to close the loop; ii) how humans generate motor commands; iii) how humans adapt to new situations and learn new skills, iv) what is the best physical and cognitive interface between humans and robots; v) what is the best way of presenting information in order to maximize humans' situational awareness. I try to address these problems from an engineering point of view. In particular, I would like to use the tools of robotics, system and control theory to model the human-in-the-loop, and to use this knowledge in designing a new generation of autonomous systems that will effectively cooperate with humans. Keywords: Multi-robot systems, Human/robot bilateral shared control, Human-in-the-loop, Swarm Teleoperation, Cooperative Control and Estimation, Communication, Synchronization, Path Planning, Distributed Algorithms, Exploration, Localization, Pursuit-evasion, Patrolling, Calibration.